All computers and Laptops slow down after any time spent connected to the internet - it's a fact of life. There are, however ways to help speed up your pc - at the same time remove unwanted files left over from program deletions over the years / months, PC Matic will remove temporary internet files, cookies, redundant registry entries and so on. The main problem IS the internet; it would be so much easier if your pc was standalone, and no internet connection were available, because most of the 'junk' a computer or Laptop acquires comes from the internet - unknown to you. 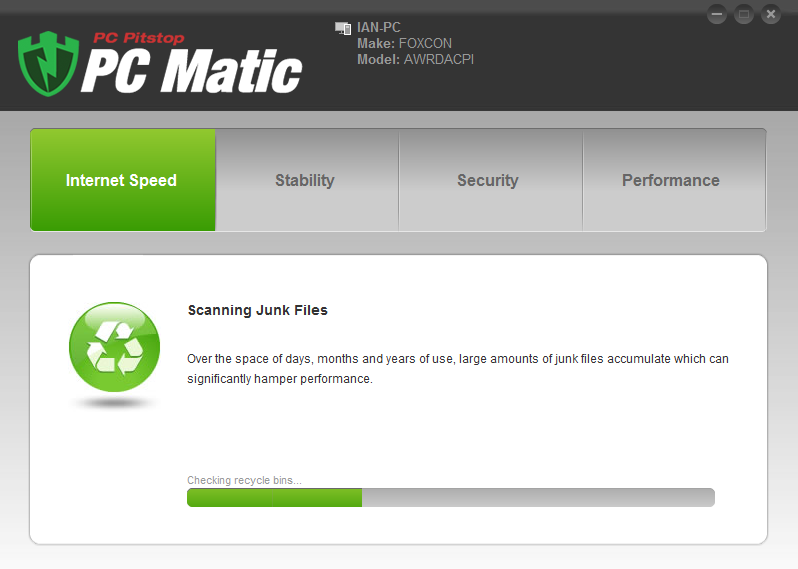 PC matic by PC Pitstop removes all of those unwanted files and restores your PC's speed and reliability. ​Modern Viruses are so sophisticated it can be very difficult to find them, or even notice that you have one on your Laptop or PC, so early detection is imperative - especially because we are buying more and more products on-line using our Bank cards and credit cards - we have to take sufficient measures against protecting our cash against the on-line criminals of the world. by automatically closing the security holes in common software such as Java and Flash. PC Matic's real time protection provides superior protection but not at the expense of performance. Sad to say that most security product don't protect against adware. PC Matic does. Why mess around with protection? Just get straight to it and protect yourself properly! I see too many Laptops and Pc's that I repair with TOTALLY inadequate protection - or indeed any means at all to keep their machine in tip-top shape (like this Pc Matic software). These things really do work. Sometimes it's more difficult clearing out the junk on a PC or Laptop if it has been left for years with no way or removing this stuff, so get to it now and sort out those niggling problems you have before it's too late! 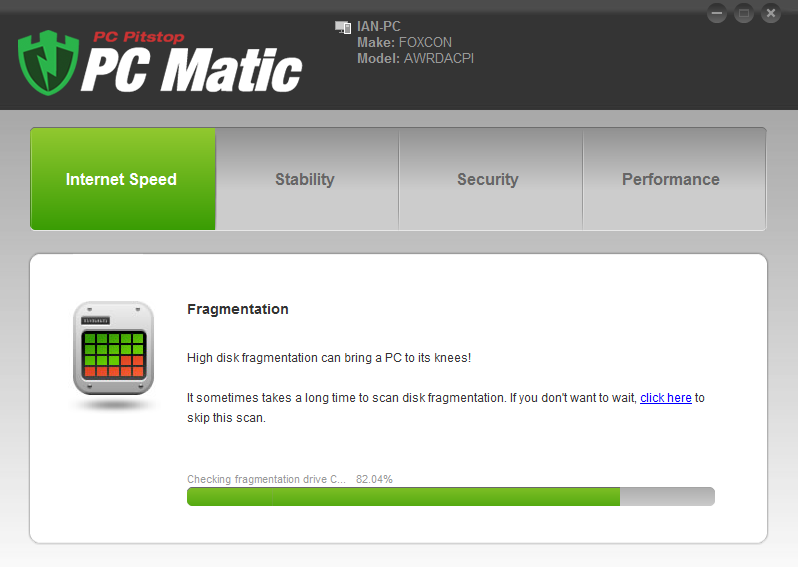 Backing up docs and re-installing is the main work I do, just because people don't know how to prevent their machine from failing because of software faults, save yourself having to bring your Pc or Laptop to people like me and have a FREE scan from PC Matic! Only pay if you like what you see! PC Matic protection has completed and passed the well respected VB100 comparative. 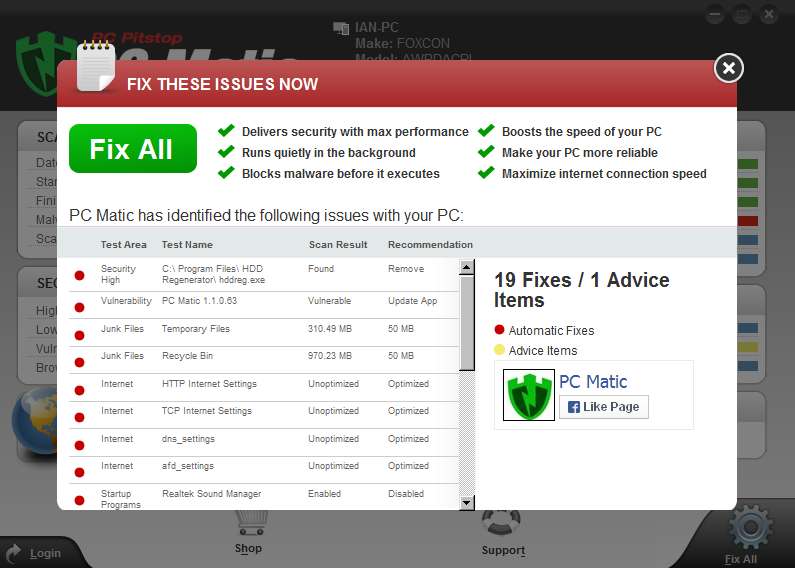 The security features evaluated in the Free PC Matic Home Security suite are the same as those included in the full PC Matic suite. 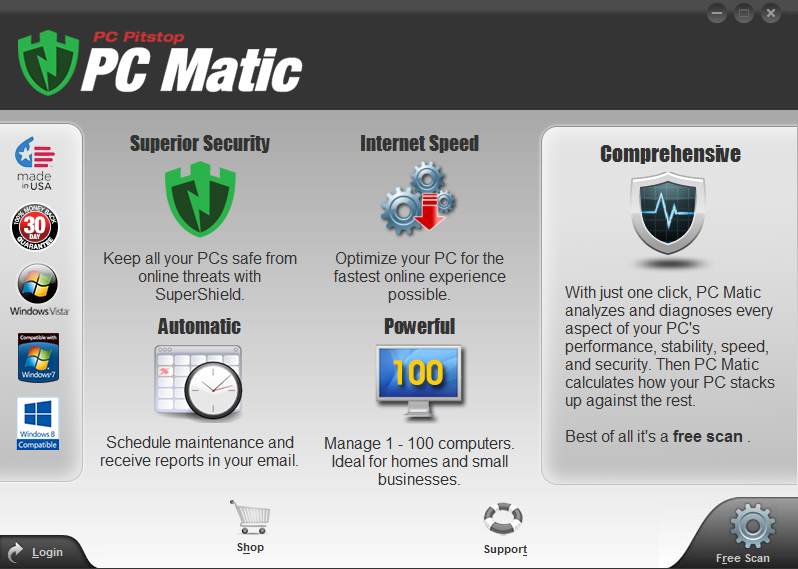 PC Matic Home Security is Free for non-commercial use on up to 3 PCs. 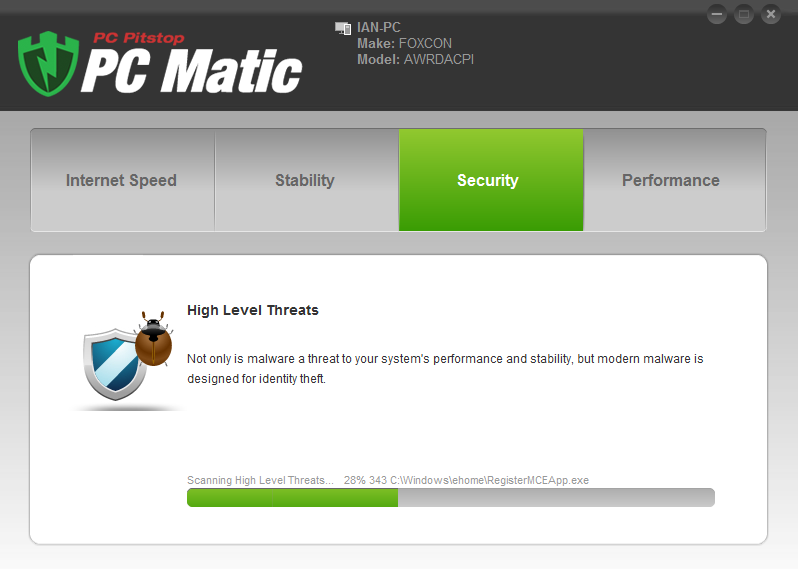 PC Matic was tested along with 44 other antivirus solutions in this independent comparative. Testing is reactive and proactive using the freshest virus samples available. 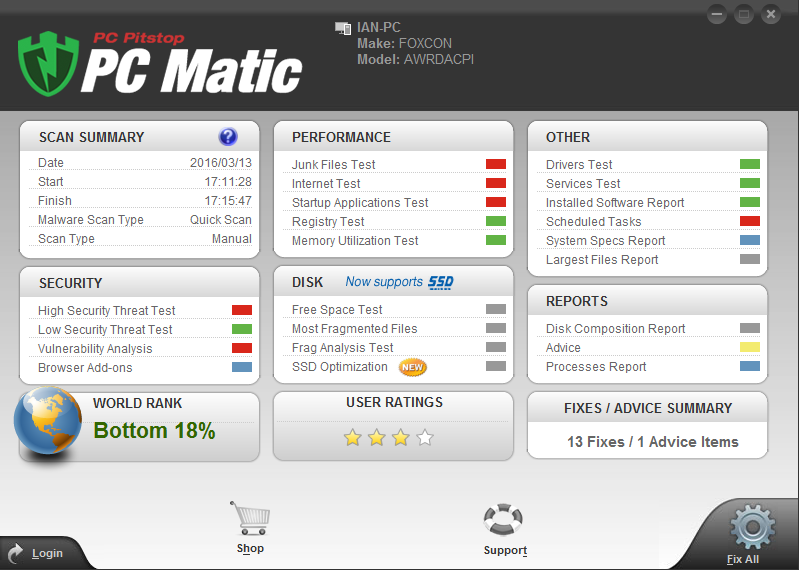 PC Matic made short work of the comparative on a system running Windows 8.1, detecting 100% of the test viruses with 0 false positives. 1. 100% detection of malware listed as ‘In the Wild’ by the WildList Organization. 2. No false positives when scanning VB’s collection of known-clean files. 3. 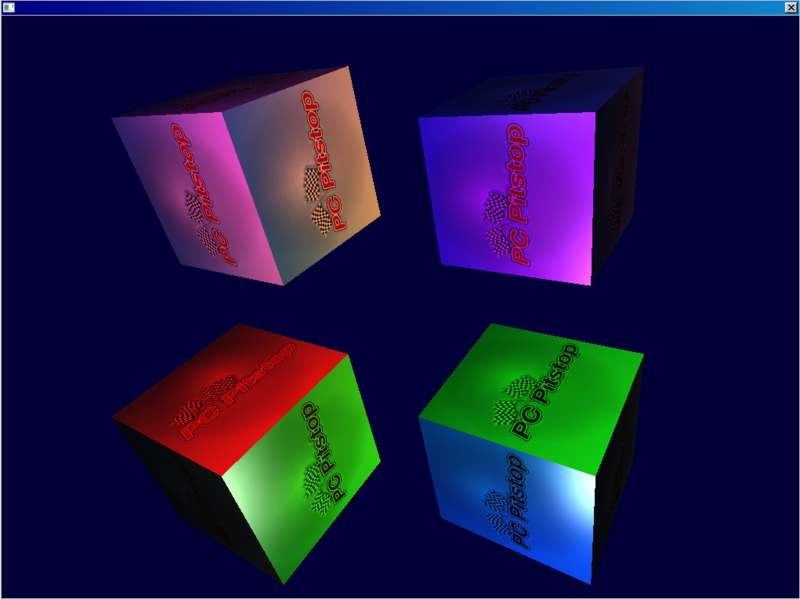 All this must be done with default, out-of-the-box settings in the VB lab environment. In August 2013, the experts at Virus Bulletin awarded PC Matic VB-100 certification as the result of their similar testing on Windows 7 Professional systems. For many years, Virus Bulletin has carried out independent comparative testing of anti-malware products. The unique VB100 certification scheme is widely recognized within the industry. Please fill out the form at Our Support Page and our Helpdesk team will get back to you within 24 business hours.